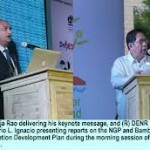 The Congress was a collective effort of Filipino bamboo scientists, farmers, academics, and other bamboo industry stakeholders to support the bamboo program. The Philippines Bamboo Industrial Development Council (PBIDC) had been mandated by Executive Order 879, to fully implement the bamboo program of the country. The bamboo program implementation coincides with the National Greening Program to bring bamboo as a fast growth plant into greater availability and to help sequester carbon from the atmosphere thus mitigating climate change. Bamboo is an ideal plant species that can be utilized for reforestation and rehabilitation of denuded forest and idle lands in the country. The Department of Science and Technology (DoST) continues giving its full support to meet the sector’s technical needs through the Forest Product Research and Development Institute (FPRDI). 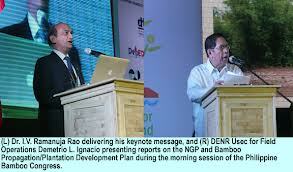 In the recently concluded National Bamboo Congress, DoST Secretary Mario G. Montejo highlighted the various technologies and assistance services that have been provided by FPRDI to the bamboo sector over the years. Among them are the FPRDI’s recent bamboo technologies, which include the bamboo veneer lathe, flattening machine, non-wood forest products dryer, engineered bamboo products, and digital moisture meter. Montejo said the DOST has a furniture testing center based in FPRDI that examines the structural soundness of locally-produced furniture, and bamboo treatment facilities installed in many parts of the country. FPRDI, since its establishment in 1957, has conducted various projects on bamboo research and development (R&D) and in the last five years has conducted 43 training courses on bamboo. The courses include drying, preservation, glue lamination, engineered bamboo processing, furniture production, and charcoal production and briquetting. Moreover, FPRDI is planning to prepare a standard for bamboo poles which can aid farmers in selling their products at a standard rate. It also intends to develop environment-friendly preservatives and non-chemical treatment methods for bamboo. Handicrafts, bamboo poles, bamboo shoots production, textiles, charcoal, furniture, pulp and paper and engineered bamboo products like bamboo floorings and bamboo panels are among the various products and applications that can be derived from bamboo. About 1 billion people around the world depend on bamboo for their livelihood as the bamboo industry has reached US$ 7 billion to US$ 10 billion dollars. Based on the the International Network for Bamboo and Rattan (INBAR) data from 2007 to 2010, the major markets for bamboo products are European Union, United States, Japan, Canada, China, Singapore, South Korea, Malaysia, Mexico, and Australia. The country has committed to plant 1 million hectares of bamboo in which 500,000 hectares of land along riverbanks. This is part of the 20 million hectare Philippine commitment to the Association of Southeast Asian Nations (ASEAN).